As you might have noticed, I have a thing about VDF displays and old calculators. 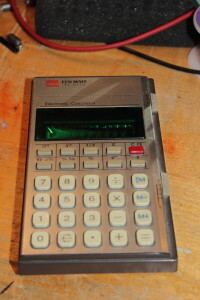 This time I found old Sharp EL-8118 which is pocket calculator with basic arithmetic operation with some nice additions. It includes features like settable floating/fixed decimal, sqrt’s and powers, percent and delta percent, constant pi, 1/x or x^(-1) and memory.